If you read our post on forming a Wholly Foreign Owned Enterprise (WFOE), you may understandably conclude that there’s no corporate service more onerous and time consuming than forming a company in China. However, dissolving a WFOE may actually claim this dubious distinction. Shareholders can’t simply close their company and walk away. China’s Companies Law sets out the requirements and formal procedures to deregister (close or dissolve) a company. When Is a WFOE Required to Deregister? Its term of operation expires or other reasons for dissolution stipulated in the original Articles of Association have occurred (Article 190 (1)). A resolution to dissolve the company is made at a meeting of the shareholders (Article 190 (2)). The company is merged or divided (Article 190 (3)). When a company is ordered to close due to its violation of the law or of administrative rules and regulations (Article 192). Once you declare dissolution to all the relevant authorities, the process can begin. Although it’s a technically demanding process, it can be broken down into eight major steps. The first and most important step is to establish a Liquidation Committee. If you’re dissolving the WFOE for reasons under Article 190(1) and (2) above, you must form a liquidation committee within 15 days. In the case of dissolution under Article 192, the regulatory body in charge will organize the shareholders, relevant departments and relevant professional to form a liquidation committee. Choosing a member of the committee to be the legal representative. Preparing a balance sheet and detailed list of all assets. Formulating principles for properties evaluation and computation. Formulating and implementing a liquidation plan. Paying debts, overdue taxes and outstanding wages as well as settling unfinished claims. Legally representing the company in civil lawsuits. Notifying known creditors in written form. Preparing a liquidation report, subject to approval by the shareholder board. Publication of the intention to dissolve the WFOE. Preparation and submission of "liquidation reports" to the Chinese government. Dissolution registration with Chinese tax authorities and payment of all outstanding taxes. Dissolution registration with Chinese Customs. Dissolution registration with the Chinese Industrial and Commercial Administration Bureau. 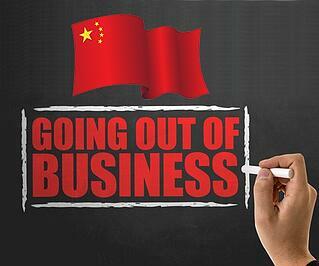 Cancellation of WFOE bank accounts in China. Statutory dissolution notification to other Chinese government offices. How Long Will Dissolution Take? When it is time to dissolve your WFOE, whether by law or because it is at that point in the life cycle of the company, in addition to having a great deal of patience, it is also imperative to have a good team of advisors, both legal and tax, to ensure you follow all of the regulations. These advisors can also work with the competent authorities to further ensure the deregistration process is properly handled from start to finish.